W1AW-Portable - Thanks for a fun year! Well, it's over now. All the W1AW-portable operations are complete. It's been a great, great year. I have had a ton of fun chasing these stations. I only wish I had gotten started in the first couple of months, rather than just the last 10. According to my log, I've worked W1AW-portable stations 1276 times. It's been a lot of fun. I'm definitely going to miss this in the new year. Two radio setup for the ARRL 160m contest. K3 on right, K2 on left. For the 2013 running of the ARRL 160m, I put in more operating hours than ever before, but I fell short of my personal best set in 2010. For 2014, I wanted to make sure that I set a new record. Two radios would allow me to call CQ while I am scanning the band for other stations. I had used two radios in 2013, but it proved to be ineffective. The inverted-L is my only 160m antenna. That would go to the K3. What I needed was some type of receiving antenna for the K2. The 80/40m dipole wouldn't cut it, as I found in 2013. I had intended to set up some K9AY loops, and I've been working on a push-button controller for it. That project ran into a snag at the last minute, so some creativity was in order. I ended up stringing a 150 foot "Beverage" antenna into the woods. At such a short length and unterminated, it's not a true Beverage, but it did allow me to receive with the K2. The two-radio setup was configured in haste about an hour before the contest. While the K3 continued to overload the K2 even with the receiving antenna, I used the K2 to populate the band-map while CQing. This did not produce a significant change in the number of Qs, but it did allow me to listen to other parts of the band during the slowest periods. Started the contest at 2201z and continued all night to 1230z, right at sunrise. The all-night shift was tough, but netted 544 Qs and 68 multipliers. Conditions seemed good but not great. Worked 47 states - all but AK, HI and MT. Early part of the contest was nearly all CQing, with short sessions of S & P to look for mults, as well as when rates got slow after 0600z. Second night started at 2210z until 0456z. It might have been better to stay on until 0600z, but I was exhausted. Got back on at 1040z, and switched off at 1240z. That's over 23 hours of contest time. There are only 28 hours of darkness in this part of the world at this time of year, and I was on the air for 22 of them. Passed 700 Qs around 0430z the second night -- which put me into personal record territory. What I needed was mults. In my previous best, I had 78 mults. However, there was no DX to be found. I heard no Europeans, and very little from the Caribbean. Worked XE, PJ2 and ZF. Heard a V3, but he did not hear my calls. Very hard the second night to decide between calling CQ and S & P. I ended up mostly S & P, because the rate was slightly better. Found missing mults the second night, with MT, LAX, SCV, SV, MAR and WTX. With three countries that makes 74. Total 745 QSOs for a total score of 111,148. I really feel like I am pushing the limits of what can be done with 100 watts and 1500 feet of wire suspended from trees. Score might be a little higher if I had stayed up the second night. This contest is always a blast. See you next year. In the last month, I passed a significant milestone. I now have over 25,000 confirmations in Logbook of the World. Not bad for using it for the last eleven years. I went back and checked, my first upload was on November 11, 2003. It took me just over a year to upload all my logs, including all of the hand-written logs that had to be typed in. Every QSO I have ever recorded, as WN8WOY, WB8WOY, N8BHE and AA4LR has been uploaded to Logbook of the World. However, those early callsigns have not been very fruitful. My novice calls have not garnered any confirmations, and my general call just two, both from my brother NJ8J. With those confirmations, I have qualified for several awards. I earned DXCC in three and a half years. Today, I have DXCC Mixed, CW, Phone, RTTY and on 40, 20, 15, and 10 meters. 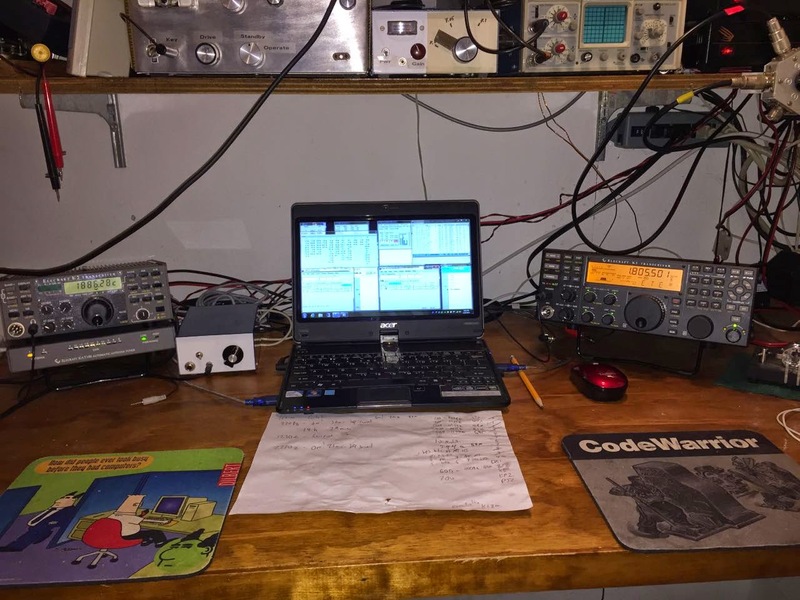 I've earned WAS Basic, CW, Phone, RTTY, Triple-Play, and Six-band WAS (160, 80, 40, 20, 15, 10). And from Floyd County, I have the confirmations to get WAS Basic, CW, Phone, RTTY, Triple-Play, and bands 40, 30 and 20m, with two other bands (160, 80m) just one state away. Logbook of the World is a tremendous resource. While getting your account set up is just a little bit of trouble, gathering confirmations is so easy and inexpensive. Much better than the old-fashioned method of using physical cards. If you have any interest in awards-chasing or DXing, you should be using Logbook of the World.